Kharazi Jungle is a jungle that expands over the entire southern part of Karamja. This jungle plays a role in the Legend's Quest and has several tasks from the Karamja Achievement Diary that will take you here. 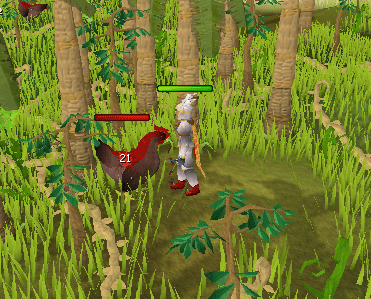 Because the Kharazi Jungle is located in Karamja, it is member's-only. Note: Regardless which way you take to get to the entrance of the Khazari Jungle, you will need a Hatchet, Machete, or both. The simplest but longest way to get to the entrance of the Kharazi Jungle is by walking. First take the boat in East Ardougne to Brimhaven for 30gp. Then walk ALL the way south until you get to the outside of the southwest corner of Shilo Village. Now find a nice easy path to cut through the forest to get into the jungle (refer to maps for the best way). Another route would be by teleporting or taking a boat to the Musa Point. 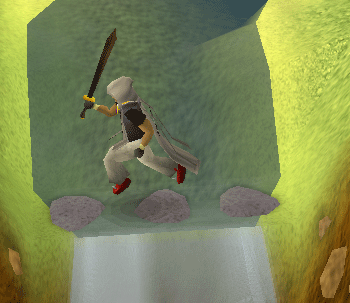 Teleporting would mean by using an Amulet of Glory to get to a point just west of the fishing dock in the Musa Point. Using a boat would be from Port Sarim or using Charter Ships. Which ever way you get to the Musa Point is fine, but once you're there, head west towards Brimhaven. Once at Brimhaven head all the way south, hugging the shores that go south. After a bit of walking you should be outside the southwest corner of Shilo Village. Now you'll need to find a nice easy path to cut through the forest to get into the jungle (refer to maps for the best way). Use one of the two methods above to get to Brimhaven. Once you're in Brimhaven go near the docks to the north. Find Hajedy and his cart. Pay the fare of 10-200gp to take the cart from there to Shilo Village (Shilo Village Quest completion needed). Once in Shilo, you'll be west of the bank. Head east and go through the gates and search the cart to get out of Shilo and past the zombies. Then go south and hug the forests/hills west. Look for a nice easy path to cut through the forest to get into the jungle (refer to maps for the best way). Probably one of the faster methods would be to take out your Karamja Gloves 3 (obtained from finishing all Karamja Tasks) and activate them to arrive in the Gem Mine. Climb up the ladder to appear in the northwest corner of Shilo village. Go south across the bridge and head east past the bank. Go through the gates and search the cart to get out of Shilo and past the zombies. Then go south and hug the forests/hills west. Look for a nice easy path to cut through the forest to get into the jungle (refer to maps for the best way). Another common method is to use the Fairy Rings. The code to the closest area is C-K-R, which will take you to the Karambwanji fishing spot. This is northwest of Shilo Village, so from there go south and you'll find the entrances to the Kharazi Jungle. Now look for a nice easy path to cut through the forest to get into the jungle (refer to maps for the best way). 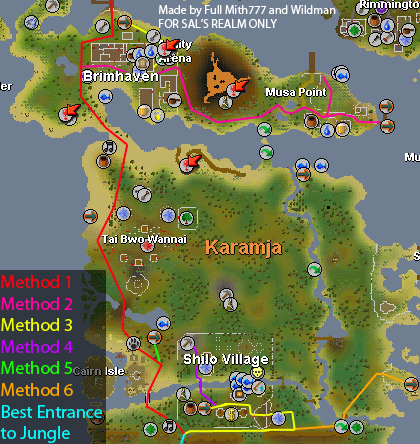 The sixth and final method would be to take the Gnome Glider to Karamja. Then head southwest to a waterfall. You'll see some stepping stones. You can hop across them, but if you fail you'll take some damage. Once across head straight west. Now look for a nice easy path to cut through the forest to get into the jungle (refer to maps for the best way). Note: Attractions 8 & 9 can be found throughout the Jungle in random places. There are four forests you can cut through to get into the Kharazi Jungle. However, the middle forest holds the easiest route in, and only requires a machete. This route is pointed out in both maps above. All you have to do is cut through 3 Jungle Bush with your Machete. However, you really only have to cut two, you stand on top of the second bush after you cut the first. The water pool is used in the Legends' Quest. In the quest, you are required to use a machete on the tall reeds to get a hollow reed. Then you'd use the hollow reed on the pool to fill up your bowl with holy water. This is also used in the Legends' Quest. 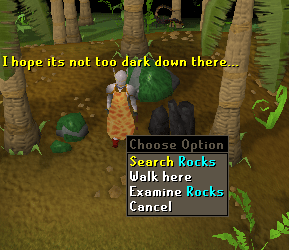 When you search these rocks, you'll be given the option to crawl through. There is a chance that you will fail and take some minor damage. Deathwings (Level 83) are located in this dungeon. 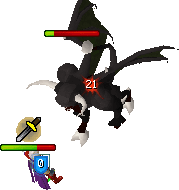 You have to kill a Deathwing to complete one of the hard-difficulty Karamja Tasks. 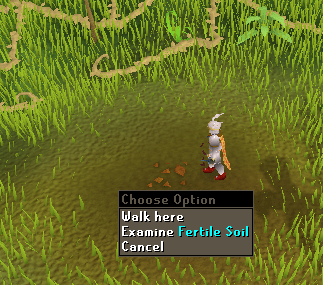 As you may have guessed, this soil is also used in the Legends' Quest. 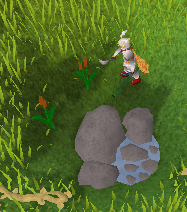 Near the end of the quest, this is where you plant your Yommi Tree. Leafy Palm Trees can be shaken to get a Palm Leaf to fall on the ground near by. A Palm Leaf can be used to help make an Oomlie Wrap. 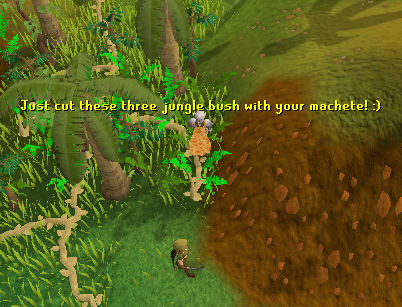 You have to collect 5 Palm Leaves to complete a one of the hard-difficulty Karamja Tasks. There are two Teak Tree locations each containing two Teak Trees. 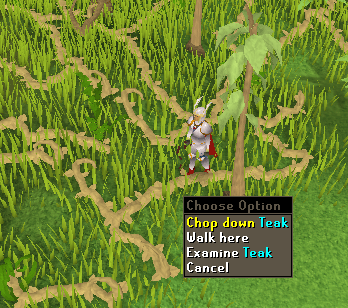 A Teak Tree can be cut at level 35 Woodcutting. There is only one Mahogany Tree location containing two Mahogany Trees. 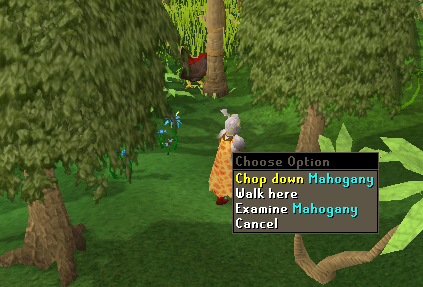 A Mahogany Tree can be cut at level 50 Woodcutting. Oomlie Wraps are made by first getting Raw Oomlie from killing Oomlie Birds (Level 46). Then you have to go near the water pool. Around the water pool are Leafy Palm Trees. Shake the Leafy Palm Tree to get a Palm Leaf to fall on the ground near by. Pick it up and use it on the Raw Oomlie. You'll now have a Wrapped Oomlie. All you have to do now is cook it which requires a Cooking level of 50. You have to cook and eat an Oomlie Wrap to complete one of the hard-difficulty Karamja Tasks. There are some Baby Geckos crawling around the Kharazi Jungle. There aren't many, thus making them harder to find. However, at least one should be wandering around near the water pool. 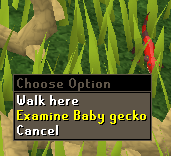 Baby Geckos are caught with level 27 Hunter using a box trap and can be your pet if you have level 10 Summoning. You can talk to Gujuo by rolling a Bull Roarer in the Kharazi Jungle. Beware that this may attract other monsters too, such as Jungle Savages. Gujuo takes part in the Legend's Quest. Jungle Savages are not aggressive, however, if you roll a Bull Roarer, they will attack you. Savages use the second strongest poison, so they CAN poison you if you attack them or if they attack you. It's probably best to leave these guys be. Nezikchened is in the final fight of the Legend's Quest and takes place near the totem pole in Kharazi Jungle. Oomlie birds are monsters only found in the Kharazi Jungle that drop Raw Oomlie as a 100% drop. The Raw Oomlie can be used to make into an Oomlie Wrap. Just like all normal Wolves, these drop Wolf Bones as a 100% drop. Wolf Bones are used to make Spirit Wolf Pouches. Also like most Wolves, they are aggressive.